Soon all of us will/may be funding these complexes all over the globe. CANON CITY — A homeless 40-year-old mother of two young children had tears slipping down her face the first day she walked into her new apartment. 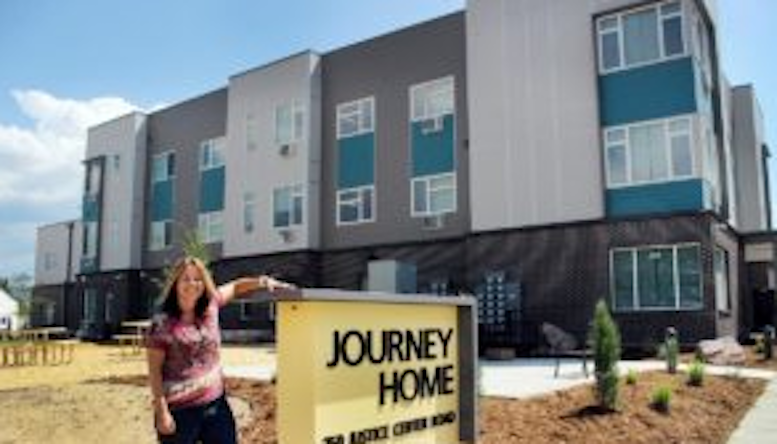 Located at 250 Justice Center Road, the $7 million 30-unit complex, comprised of 22 one-bedroom apartments and eight two-bedroom apartments, is the first homeless housing complex built in a rural Colorado community. Reese, a former Pueblo resident who had returned home ended up in Canon City after she was not able to get help in Pueblo. “I was not technically a resident because I had left Pueblo and they don’t have the means to help everybody, so I ended up here in Canon City and it all fell into place,” Reese explained. She went to Loaves and Fishes for help and heard about Journey Home, so she decided to apply. “I usually run to my family to help me, so I’ve never done anything on my own. I am 40 and finally doing something — I learned I can do it,” Reese said. Not only did she get a place to live for herself and her children Justine, 11 and T.J., nearly 2, she secured a job at the Canon City McDonalds. “The rent is based on your income and number of people in your family and the utilities are all included,” she said. When Reese realized she would have a safe and secure home plus all the furniture and household items she would need, “I just cried. The community came through big-time,” she said. Clement said a local team came up with a list of needed household items for each apartment and asked members of the community to “adopt” an apartment at a cost of $350 each to supply items such as pots and pans and dishes for new residents. “Within four days all the apartments were adopted and people still wanted to help. So we got a big fancy grill, supplies for the community area like a coffee pot, computers for the computer lab from the school district, exercise equipment for the exercise room and local artists donated artwork,” Clement explained. The building even has a life-skills classroom and a meeting room, which is open for use by the public. First Stitches, which has stores in Canon City and Pueblo, galvanized local quilting groups and were able to donate a new quilt for each apartment. On the way are five sewing machines which Clement said can be used to teach residents to sew and, perhaps even, create something they can sell to generate income. For resident Jimmy White, 68, and his dog Tank, 13, a tiny Chihuahua he jokingly describes as, “48 ounces of fury,” living in the new apartment is a vast improvement over the 17 months they spent living in his van. He ended up homeless when his roommate who was renting him a room was evicted. “I had two dogs that didn’t weigh 20 pounds put together but no one would rent to me so what are you going to do? I lived in my van,” he said. “I could not park anywhere for long without someone calling the police. I always had to keep moving and I’m too old for that crap,” he said. For the first time since he got divorced 25 years ago, he has a place to call his own. Now down to one dog, he and Tank can live comfortably off his Social Security income. “Tank loves it here just like his daddy. I pay 30 percent of my income for rent and I can pay my car insurance, gas for the van and my cellphone and still save a little,” he said. The retired design and draftsman even has room for a table where he can tinker with his hobby of designing and building tiny models of barns, windmills and other whimsical creations. “When I came here I could not believe it. I am pre-diabetic so I have improved my diet from living on the street, I sleep better — it’s great having my own place,” he said. Clement said by following the Housing First model, the ministry helps the homeless with shelter first then it allows their focus to change to other issues such as employment, dealing with mental health issues and strengthening family ties. Clement said when she heard of Gov. John Hickenlooper’s housing summit she organized a team that included the Department of Human Services, Sol Visa Health, the Central Colorado Housing Authority and Loaves and Fishes with the goal of trying to bring homeless housing to Canon City. After 15 years of working with the homeless, the past three with the goal of opening Journey Home, she has succeeded with a big boost from partner Cardinal Capitol Management, which stepped up to the plate to fund the project in exchange for state tax credits. The public is invited to celebrate the Journey Home grand opening at 2 p.m. July 24. The event will feature a program, refreshments and tours.